Location: Located on the corner of Alexandra Road and Watch House Parade. Substantial Edwardian public house. 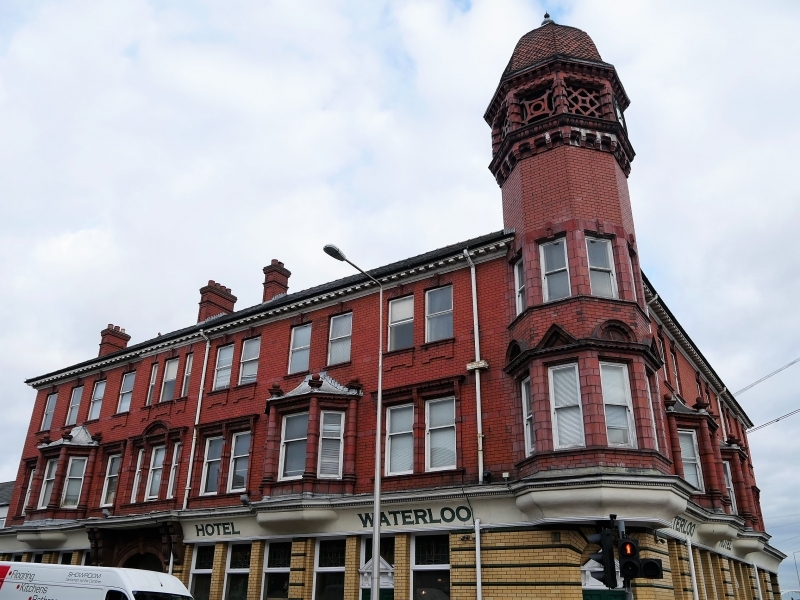 Present Waterloo Hotel replaced earlier public house on the same site. Opened in 1904. Three storeys, prominently located on corner site opposite to main entrance of Newport Docks. Red brick elevations with terracotta detailing. Slate roof with timber dentil cornice and red brick stacks, each with moulded cap and stringcourse, and two panels to front face, with plain pots. Corner emphasized by tall, hexagonal clock tower with ogee roof covered in fish-scale clay tiles with knopped, lead-dressed finial. Terracotta fretwork lantern with modillion cornice rises from a corbel table. First floor of tower is cantilevered out over corner entrance of public bar with ogee moulded fascia. Upper floor to both elelvations has paired sashes (some replaced by modern windows) with horns each with terracotta keystones flanked by scrollwork and brick aprons beneath. First floor has a series of canted bays with dentil cornice and heavy, terracotta pilasters, topped by ball finials carried on projecting caps; swept, hipped, lead-dressed roofs; paired sashes with similar ovolo-derived moulded terracotta surrounds; dentil cornice above carried on consoles with guilloche ornament. Ground floor is faced in glazed, yellow brickwork with green banding, cills and fielded panels to stallriser. Windows have leaded, coloured glass frieze panels and etched glass beneath. Impressive, arched porchway to Alexandra Road frontage with flat canopy carried on terracotta consoles with moulded terracotta archway with keystone beneath. Enriched with guilloche and egg and dart ornament with scrolled cartouche to the spandrels, carried on twin pink granite columns supported on terracotta, fielded panelled pedestals; bay above is advanced with Venetian window at first floor level. Original timber doors inset within porch. Fine contemporary interior survives with long "L" shaped yellow faience bar. Panelling incorporating shelving and cupboards behind and over the bar. Etched glass screens between booths. Servery to hallway with Queen Anne detailing to staircase. Art Nouveau style tiling and contemporary light fittings. 1950's snack bar with contemporary fittings and servery to room on left hand room of main entrance.